Not a great Saturday. High calorie, no nutrients. I tried to go with the flow, but obviously I need to take charge & make a plan in these situations. I weighed in this morning and I am down 2 pounds! This puts me right on target for my goals. 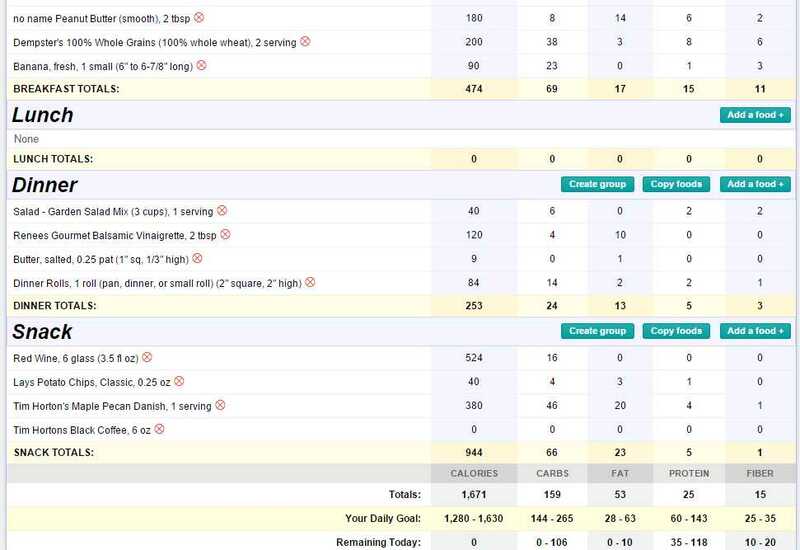 I am pretty happy with that, really didn’t know how it was going to shake down the first week given that I was challenged to find a good nutrition balance, not eating enough some days, totally gorging on empty calories others, and not incorporating any kind of fitness into the mix. So yeah, go Me! I am pleased! Back on track for Sunday though! Woo hoo! These are some good numbers. We ended up going to the Bistro, which is fine … if I want pasta. But pasta is pretty high calorie and carbs, so I didn’t want pasta. And he apparently didn’t want anything, which made me wonder why we were even going to dinner when I could have microwaved some really healthy leftovers at home, but I didn’t question, I just smiled and went and ordered the garden salad, a glass of wine, and ate a single dinner roll with just a smidgen of butter. I was starving when I went to the restaurant and I was starving when I left. Which meant that when we got to the club for karaoke I was drinking on an empty stomach, so I was getting tipsy pretty quickly. Now he was starving and buying bags of chips like he was four people. I nibbled slowly and just a bit, tracking each chip I put into my mouth. I ended up drinking more wine than I had allotted or intended because I got way more drunk than I normally would have which lowered my inhibitions. Then on the way home we went to Tim Hortons and I got a danish because I was absolutely stomach growling famished … and very very drunk. Normally I could drink what I drank and hardly feel a thing, just a little buzz, so that was kinda bizarre. I tracked everything though, didn’t bury my head in the sand, faced the bitter truth of the situation and woke up Sunday determined to have the best day possible, which I did! 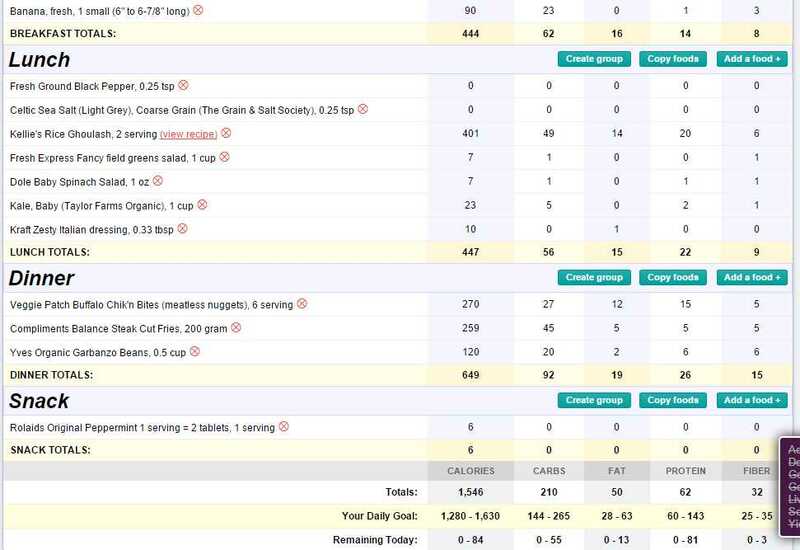 I ended up having a good day Sunday, hitting my number targets. This morning I woke up all by myself at 7 am, got up by 7:30, and went for a walk before breakfast. I only went 20 minutes and it was challenging. I used to walk easily four times as far in an hour, five years ago, so I am now acutely aware of how much I need to step things up to get back to that point. But that’s okay, as they say, you can’t fix what you don’t acknowledge. So I am putting it all out on the table in plain view, acknowledging the hell out of it, and now I begin to fix. #4 Wealth is pouring into my life. I am excited about this one! Woo hoo! Wealth is pouring into my life, baby! I can’t wait to share it with my family and the people I care about most, who could use a little more wealth in their lives! Today I am thankful for the morning sunshine on the river, it is so beautiful and calming, as is the moonlight of the full moon that will happen tonight. Last night it wasn’t quite full but it was gorgeous reflected on the calm water. I am thankful for a good strong hot cup of coffee this morning. Mmmm mmmm so delicious. I am thankful for a boyfriend who loves me enough to try to plan a date for me, even though it is way outside his comfort zone to do so. I am so thankful that I am able to wake up on my own time, when my body is naturally ready, without the intrusion of an alarm clock. I am thankful I am physically able to walk and enjoy the fresh morning air in my lungs. I am thankful for the water I am drinking 8 glasses of each day and the dewy glow it is giving to my face as I hydrate. And so much more.